Identification: Smith (1985); Hubbs et al. (1991); Menhinick (1991); Page and Burr (1991). Native Range: Coastal waters from Massachusetts to northeastern Mexico. Also in West Indies (Page and Burr 1991). Table 1. States with nonindigenous occurrences, the earliest and latest observations in each state, and the tally and names of HUCs with observations†. Names and dates are hyperlinked to their relevant specimen records. The list of references for all nonindigenous occurrences of Cyprinodon variegatus are found here. Means of Introduction: Initial introductions were presumably the result of bait-bucket releases (Stevenson and Buchanan 1973; Kennedy 1977). The species was first found in Lake Balmorhea in the 1960s (Stevenson and Buchanan 1973) and in Leon Creek in the 1970s (Kennedy 1977). Hubbs (1980) suggested that its appearance in Leon Creek may have resulted from a water change that took place at a highway bridge crossing during the transport of live bait from the Gulf Coast to the Pacific Coast. Kennedy (1977) suggested that it was probably introduced by local fishermen or bait dealers. The species first appeared in the Pecos River proper between 1980 and 1984 (Echelle and Connor 1989). Wilde and Echelle (1992) believed that Lake Balmorhea could have been the source of C. variegatus introduced into Leon Creek or the Pecos River proper; however, the researchers could not rule out the possibility that the species was introduced into these waters from elsewhere. Based on results of their electrophoretic study of fish taken from the Pecos River proper, Wilde and Echelle (1992) suggested that hybrids are widespread as a result of intradrainage dispersal and artificial transport of hybrids rather than multiple introductions of C. variegatus. Their data also suggested that the initial introduction of this species into the Pecos River probably occurred in the vicinity of Pecos, Reeves County, Texas, and hybrids subsequently dispersed both up- and down stream. However, recent research suggests that Red Bluff Reservoir was the original site of introduction (Childs et al. 1996). This species was not found in subsequent collections in Washington state concluding this introduction failed to produce a breeding population (Greenfield and Grinols 1965). 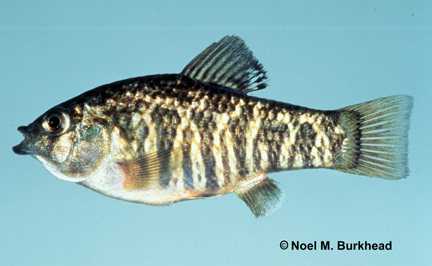 Impact of Introduction: Introduced Cyprinodon variegatus are known to hybridize with other native Cyprinodon species, including the endangered Commanche Springs pupfish C. elegans (Stevenson and Buchanan 1973), the Pecos pupfish C. pecosensis (Echelle and Connor 1989; Wilde and Echelle 1992, 1997; Childs et al. 1996; Echelle et al. 1997), and the endangered Leon Springs pupfish C. bovinus (Minckley et al. 1991; Echelle and Echelle 1997). Hubbs et al. (1991) stated that C. pecosensis is nearly extirpated in Texas due to introgressive hybridization with introduced C. variegatus. Wilde and Echelle (1992) reported that hybrids between introduced C. variegatus and Pecos pupfish C. pecosensis have replaced endemic Pecos pupfish in a 430-km stretch of the Pecos River and have dispersed into downstream areas well outside the recorded range of Pecos pupfish. They concluded that hybridization with C. variegatus had reduced the range of the Pecos pupfish by 60 percent. Because the appearance of C. variegatus was likely the result of a bait bucket introduction involving few individuals, it serves as an example that a small number of individuals can have a dramatic effect on another species (Echelle and Connor 1989). Introduction of C. variegatus into a spring-fed watercourse of Diamond Y Draw in the 1970s rapidly led to extensive hybridization with the endemic C. bovinus and local genetic swamping of the native species (Hubbs 1980; Minckley et al. 1991). The hybrids were eradicated and the native species was restored to the area (Hubbs 1980). Subsequently, however, C. variegatus was again introduced to the area, and this led to genetic introgression of the entire wild population of C. bovinus (Echelle and Echelle 1997). In contrast to the high levels of genetic introgression resulting from introductions of C. variegatus into the ranges of the other two species of pupfish endemic to the Pecos River drainage, Echelle and Echelle (1994) found little evidence of genetic introgression after more than two decades of contact between C. elegans and C. variegatus. Remarks: As of 1992, the distribution of C. variegatus x C. pecosensis hybrids in the New Mexico portion of the Pecos River drainage was restricted to headwaters of Red Bluff Reservoir and the mouth of the Delaware River a few kilometers north of the New Mexico-Texas border, Eddy County, New Mexico (Wilde and Echelle 1992). More recently, Echelle et al. (1997) reported that all known New Mexico populations of C. pecosensis from Loving downstream to Red Bluff Reservoir now contain genetic material from C. variegatus. Childs et al. (1996) suggested that the introduction of C. variegatus may have occurred at a time when C. pecosensis populations had been catastrophically depleted, and therefore susceptible to genetic swamping. They felt that this would explain the rapid spread of introduced genetic material in the Pecos River and other genetic changes observed among sample localities. Many voucher specimens, presumably a mixture of C. variegatus, C. pecosensis, and hybrids, are housed at OSUS. Childs, M.R., A.A. Echelle, and T.E. Dowling. 1996. Development of the hybrid swarm between Pecos pupfish (Cyprinodontidae: Cyprinodon pecosensis) and sheepshead minnow (Cyprinodon variegatus): a perspective from allozymes and mtDNA. Evolution 50(5):2014-2022. Echelle, A. A., and P. J. Connor. 1989. Rapid, geographically extensive genetic introgression after secondary contact between two pupfish species (Cyprinodon, Cyprinodontidae). Evolution 43(4):717-727. Echelle, A.F., and A.A. Echelle. 1994. Assessment of genetic introgression between two pupfish species, Cyprinodon elegans and C. variegatus (Cyprinodontidae), after more than 20 years of secondary contact. Copeia 1994(3):590-597. Echelle, A.A., C.W. Hoagstrom, A.F. Echelle, and J.E. Brooks. 1997. Expanded occurrence of genetically introgressed pupfish (Cyprinodontidae: Cyprinodon pecoensis x C. variegatus) in New Mexico. Southwestern Naturalist 42:336-339. Greenfield, D.W. and R.B. Grinols. 1965. Cyprinodon variegatus on the Olympic Peninsula, Washington. Copeia 1965(1):115-116. Hubbs, C. 1980. Solution to the C. bovinus problem: eradication of a pupfish genome. Proceedings of the Desert Fishes Council 10:9-18. Hubbs, C., T. Luciere, G.P. Garrett, R.J. Edwards, S.M. Dean, and E. Marsh. 1978. Survival and abundance of introduced fishes near San Antonio, Texas. Texas Journal of Science 30(4):369-376. Kennedy, S.E.1977. Life history of the Leon Springs pupfish, Cyprinodon bovinus. Copeia 1977(1):93-103. Minckley, W.L., G.K. Meffe, and D.L. Soltz. 1991. Conservation and management of short-lived fishes: the cyprinodontoids, Chapter 15. 247-282 in Minckley, W.L., and J.E. Deacon, (eds.). Battle against extinction: native fish management in the American west. University of Arizona Press, Tucson, AZ. Stevenson, M.M. and T.M. Buchanan. 1973. An analysis of hybridization between the cyprinodont fishes Cyprinodon variegatus and Cyprinodon elegans. Copeia 1973(4):682-692. Wilde, G.R., and A.A. Echelle. 1992. Genetic status of Pecos pupfish populations after establishment of a hybrid swarm involving an introduced congener. Transactions of the American Fisheries Society 121(3):277-286. Wilde, G.R., and A.A. Echelle. 1997. Morphological variation in intergrade pupfish populations from the Pecos River, Texas, USA. Journal of Fish Biology 50(3):523-539. Wonham, M.J., J.T. Carlton, G.M. Ruiz, and L.D. Smith. 2000. Fish and ships: relating dispersal frequency to success in biological invasions. Marine Biology 136:1111-1121.